Throughout each and every day, we can be nurturing the gifts in children and helping them to know that they are lovable and loved, valuable and valued. 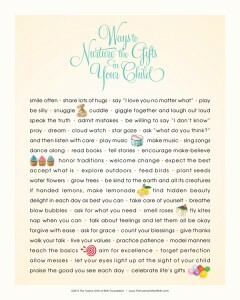 As a reminder to consciously choose caring ways to be with the children in your life, you may wish to download this WAYS TO NURTURE THE GIFTS IN YOUR CHILD poster and place it in a visible location. Click on image to open JPG file for download or printing. Feel free to write and suggest more “ways” from your perspective and experience.